After a tumultuous few weeks of fevered anticipation, Apple Music has landed. 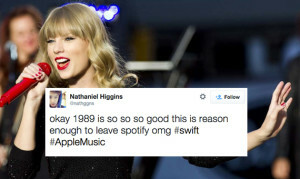 30 million songs, a real-life radio station and the entirety of Taylor Swift’s 1989 are features that set the tech giant’s foray into music streaming apart. Since launching on June 30th, thousands have now started their three month trial. In the wake of serious tumblr backlash from Ms Swift herself, artists are now receiving revenue from song plays during this period. First impressions praised Apple Music’s discovery features, but have taken issues with menus, navigation and collaborative features found in competitors. Other streaming services are scared, as Apple Music threatens to engulf the entire music streaming market. Recent research has found that people are leaving its biggest competitor in droves every day. We’ve looked for people announcing they’re leaving or uninstalling Spotify on Twitter and Facebook. It’s only a small sample of the people actually uninstalling the app, but the number is already in the thousands in just two weeks. 40% of these posts specifically cite Apple Music being better as a reason for leaving the service. 2% blame the new ‘ugly’ logo. 7 people deleted the app because Spotify sent them an email recommending the new Tyga album. While Spotify is facing the biggest casualties, it’s not alone. Pandora, Tidal, Rdio, and Google Play Music are all facing falling subscriber numbers. Pandora takes the number two spot for unhappy users, then Tidal is in third. Like with Spotify, all of these services saw a spike in ‘ditchers’ on the day Apple Music was announced, then released. Apple Music has barely been on the airwaves for a week. The next few months are vital – will Apple get a vice grip on its users before they’re asked to pony up? In the coming weeks, we’ll be looking at what users haven’t made the jump to Apple Music. Stay tuned.